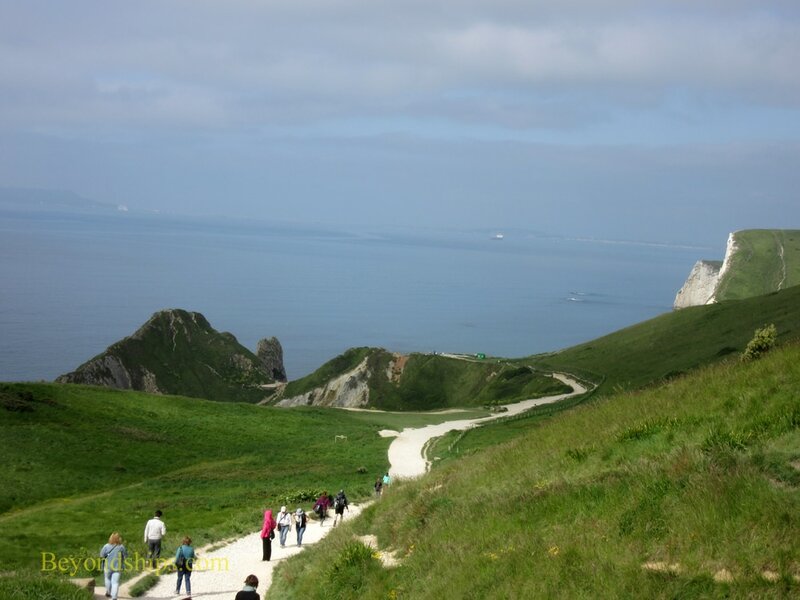 Above: The main trail between Durdle Door and Lulworth Cove. Below: Man O' War Bay. 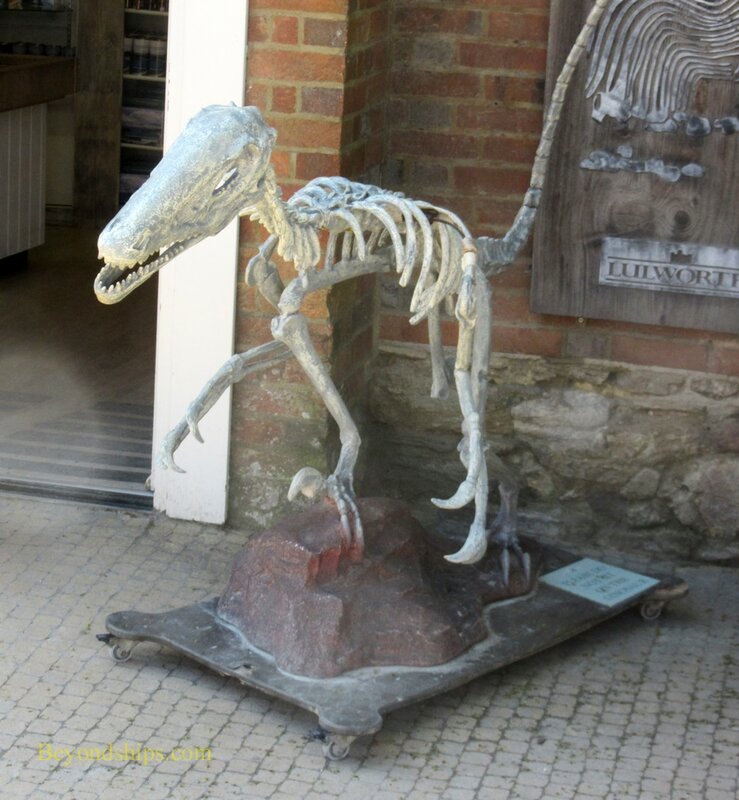 The Jurassic Coast is a 95 mile stretch of coast line extending from Exmouth in Devon to Studland Bay in Dorset. It was designated a UNESCO World Heritage Site in 2001 not just because of its natural beauty but because it is one of the few places in the world where you can see an almost complete sequence of rock formation extending over 185 million years. Layers of rock were laid down here during the Triassic, Jurassic and Cretaceous periods. Erosion by the sea has made and continues to make the layers visible. In the process, steep cliffs, natural rock arches, stacks, caves, bays and beaches have been created. Numerous fossils have also been unearthed. 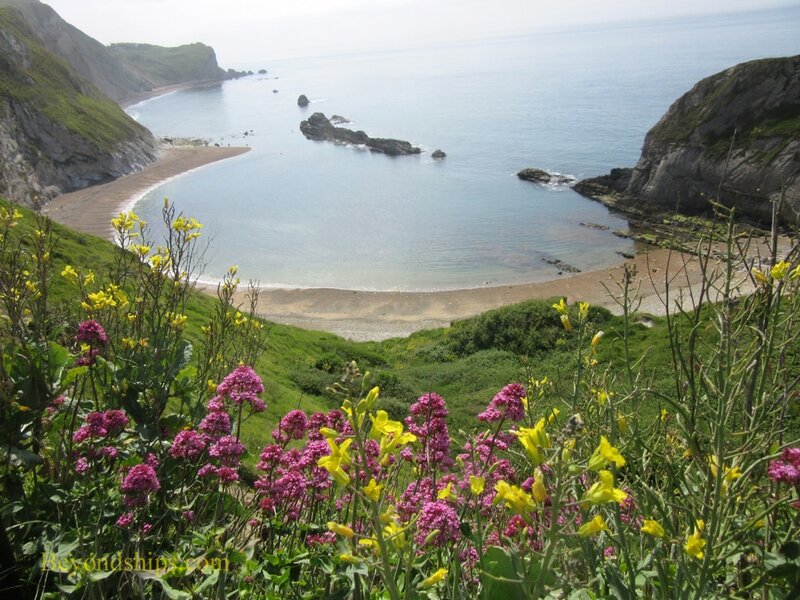 While the Jurassic Coast is a dream for geologists and palaeontologists, the attraction for most visitors is the natural beauty and spectacular scenery. It is a diverse area and many visitors hike large stretches of the Southwest Path, which runs its length. For visitors with less time, one of the most popular stretches is the stretch between Durdle Door and Lulworth Cove, two of the most famous and spectacular features on the Jurassic Coast. It is only about two and a half miles with a graded path. However, it does involve making some steep ascents and descents, which some may find strenuous. Also, the rocky trail can be slippery. The view from the trail is breathtaking. It is quite far above the sea and on a clear day, you can see quite far. Great white chalk cliff faces plunge precipitously from the rolling green fields above. 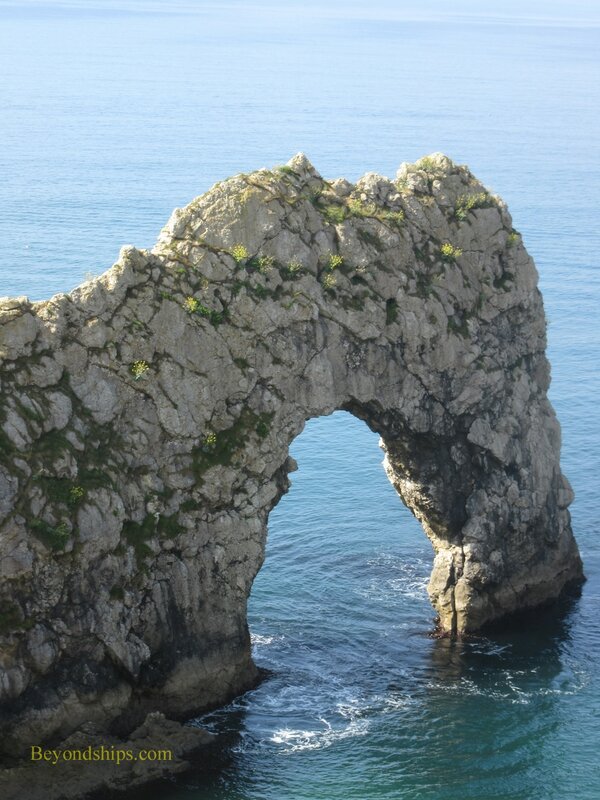 Durdle Door, sometimes referred to as the “English Natural Wonder,” is an arch that the sea has carved out of what was once a limestone cliff. It is connected to the mainland by an isthmus of Portland stone. The normally horizontal sedimentary strata have been tilted almost to the vertical. This happened some 11 million years ago when the European and African continental plates collided. There are fossils embedded in the stone. Facing the arch across a narrow inlet is a sloping beach. There is a path that gives access to the beach but it is more than 200 feet down to sea level from the main trail. Also, pieces of the cliff break away from time to time landing on the beach. Still, the beach is popular with visitors and for picnicking. 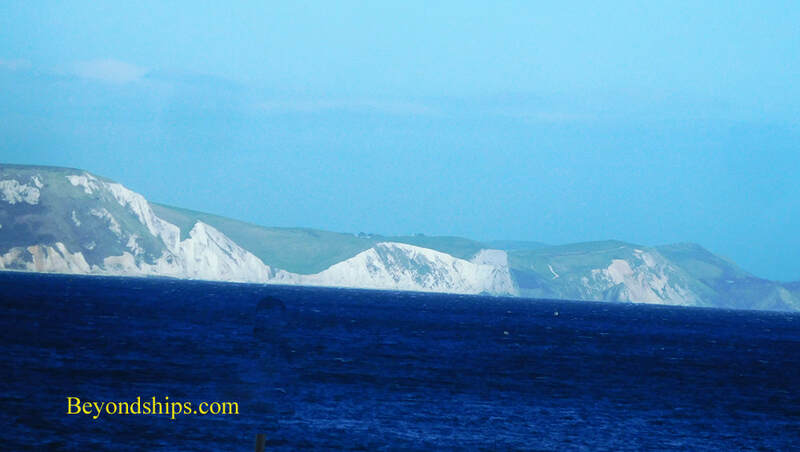 ​On the other side of the isthmus connecting Durdle Door to the mainland is Man of War Bay. This is a small sandy beach almost surrounded by vertical cliffs. There are 150 steps from the main trail to the beach. The view from the main trail is once again impressive. 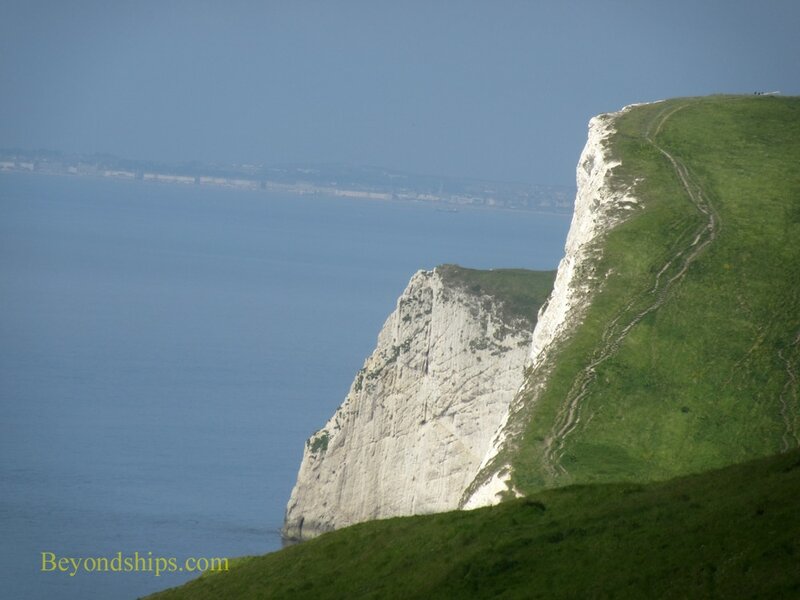 ​Take the main trail east over a rolling hill on its way to Lulworth Cove. 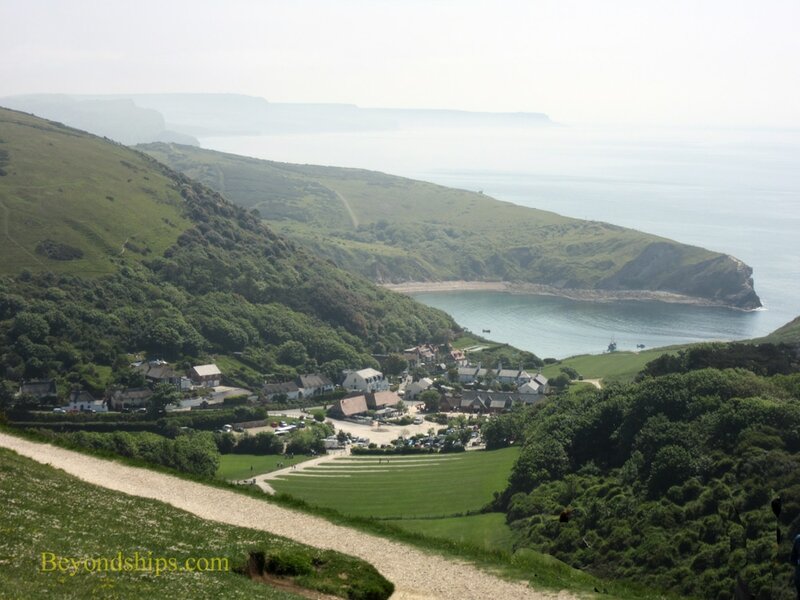 From the crest of the hill, you have a panoramic view of the little village of West Lulworth far below and of Lulworth Cove beyond. Left: There are no live dinosaurs on the Jurassic Coast. ​Below: A view across the sea.